Transforming Hollie: Just Tell Me What to Eat... Book giveaway! Most everyone who knows me knows that I am addicted to Weight Loss/Fitness books... it's an obsession. I buy them, read them, and shelf them. I also get a lot of books for FREE from publishers who want me to review. Well, I just purchased a new book today that am anxious to read, and it reminded me of a vow I'd made a few weeks ago to start purging my bookshelf at home. But instead of packing them up and giving them to Goodwill, I'm going to give them away on my blog! The first book up for grabs is Just Tell Me What to Eat! by Timothy S. Harlan, MD. Want this book? All you have to do is leave a comment on THIS POST. You have until the end of this year (December 31, 2012 at 11:59 p.m.) I will choose a comment at RANDOM on January 1, 2013! I will also post another book at that time. 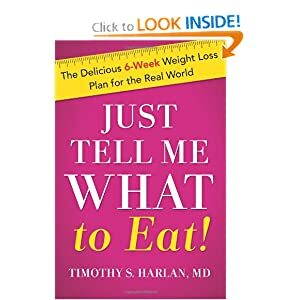 I need someone to help me with the correct foods and this book looks like it has the right plan down and could be a help. I am currently serving as a volunteer Women's Wellness program manager for a women's organization and if I win; plan to give the book away as a gift to the winner of an 8 Healthy Living Challenge at the end of January. This book would be awesome to start the new year off!! I love reading fitness /food books too. Haven't read this one yet. I could def use this book! This book sounds great. Nutrition and good food choices can be really overwhelming. Happy New Year! Great Promo!! and Great Website!! Thank you so much for getting info out to the masses in such a positive way!!! I'd love to read this book. Hope I win. I would love this book. I read loads of health and fitness books! I would love to add this book to my collection! I've been on a health kick for about 6 months now and I'm still learning something new every day! In a perfect world you would prepare the food also. Good luck to you in the New Year. I, too, am obsessed with reading up on health foods and exercise and new ways to cook, as well as open to new ideas. I would love to read this book, and once I am done with the book, I would also pass it on! I think this book would be a great benefit to me. I have always been trying to do the best I can weight it came to fitness & weight loss. It has been a big struggle for me ever since I was a teenager. I am currently the gastric bypass surgery & I feel this would be like a blessing being able to add not only what my doctor & nutritionist said, but being able to take in what the book has to say & incorporate it in my life. Thank you for this opportunity. You Rock Hollie!! 2013 Here we come! Would love to read this. Sounds great.